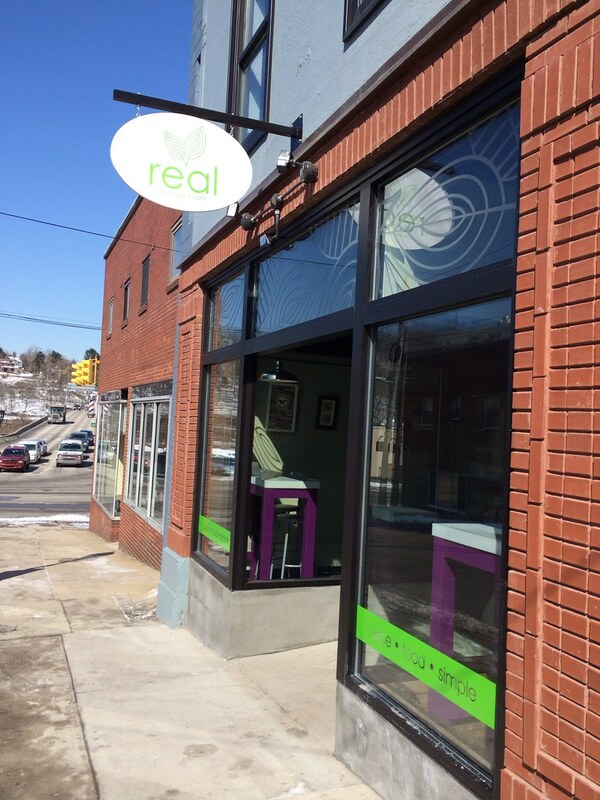 Real Juice Bar and Cafe is the new kid on the downtown Morgantown block. It took the place of Garcia's Latin Market, which moved to the former Carvel location, at 119 Pleasant St. WBOY and WV Living already have short blurbs about it - and it just opened on March 3! It's getting a lot of attention. That might be because it's (one of?) 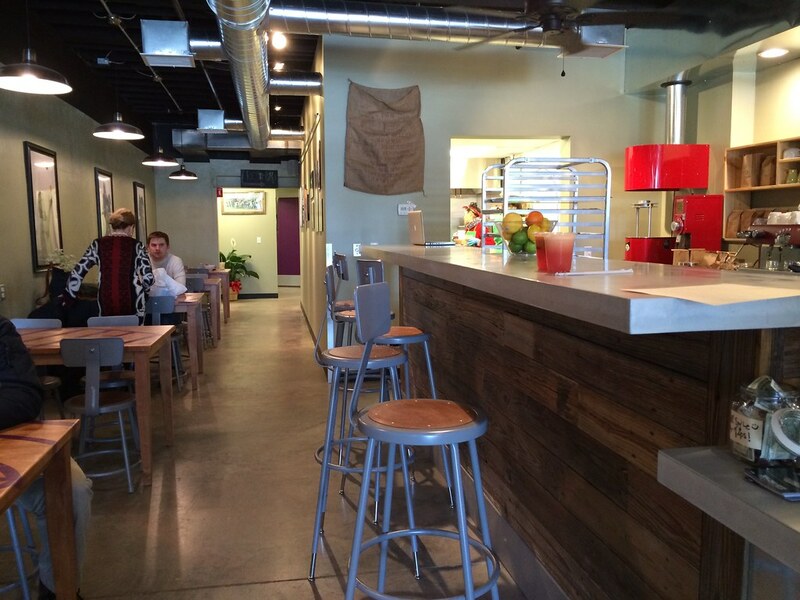 the first juicing/health restaurants in the area. 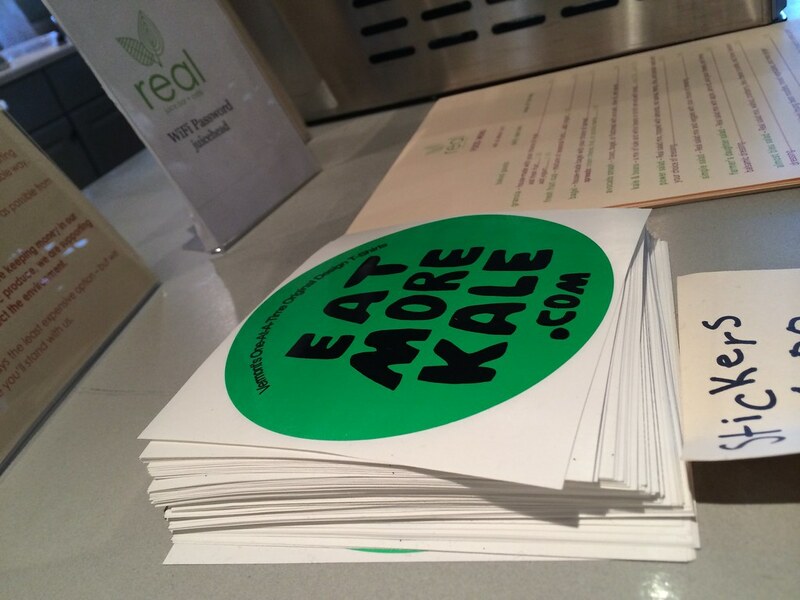 The only other restaurant that focuses on healthy items is the Shape Shop - that I know of. Juicing is kind of a trend right now. I'm not going to act like I know anything about it, because I'll let the 500 or so blogposts about ridiculous food I've eaten speak for itself. So, this place is right across from Black Bear, so there is that small parking ... garage(?) right there. That's convenient. When Tony and I walked in, it's pretty much what I would've expected. 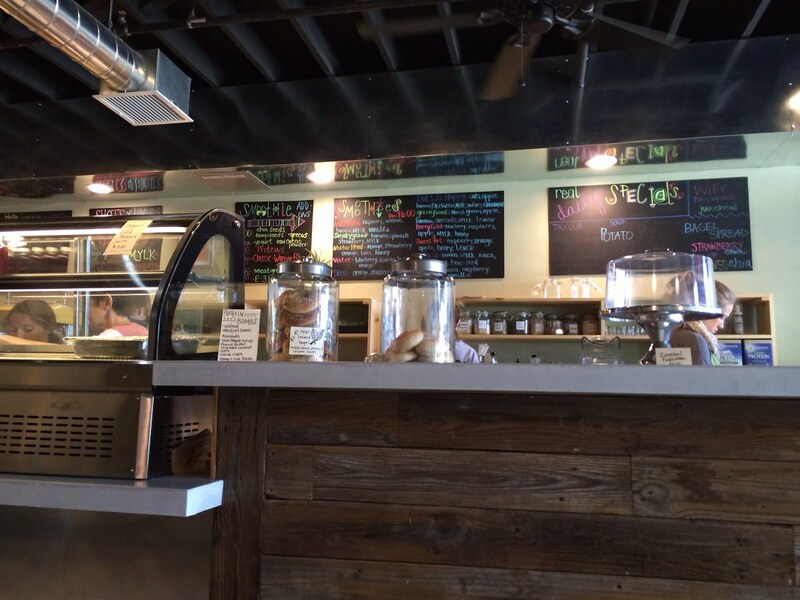 Some bright colored chalkboards, wooden tables, cute purple designs. Inviting and fresh. There were a few people working on laptops, so it's nice to have a cafe vibe here. 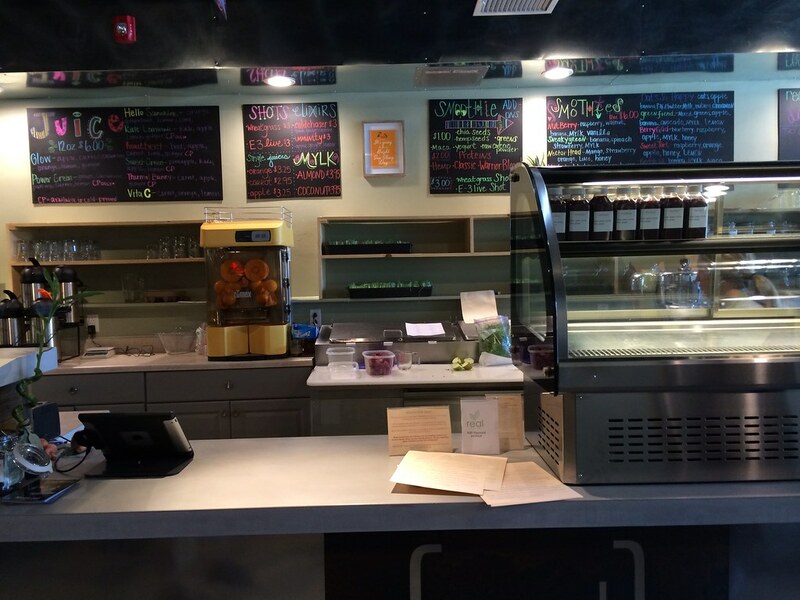 They have a number of juices, smoothies and vegetarian food items. 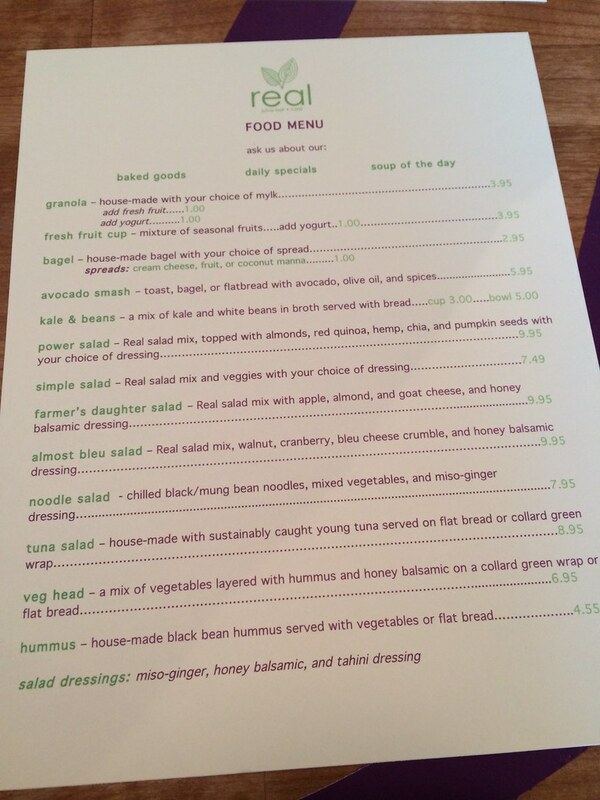 Mostly salads, there's hummus and a few other odds and ends. The only meat I saw was tuna. I ordered the "avocado smash" on a bagel, which is avocado, olive oil and spices. 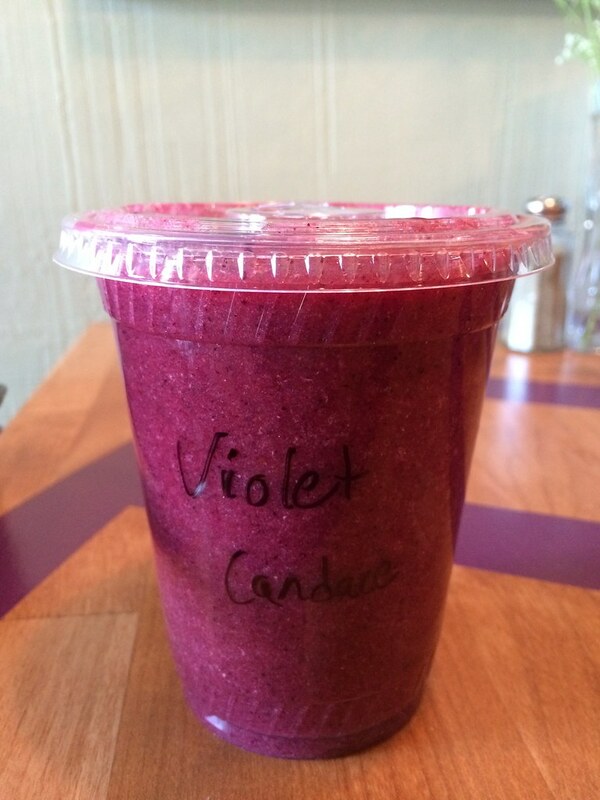 I also got their soup of the day - potato - and a smoothie: "violet," which has blueberry, mango, lemon and orange. That, with a small tip, came out to about $18. That's hefty for lunch. Smoothie: It was very liquid-y. I wish it was a bit thicker. It was also not cold - more room temperature. The flavor was good, though. It tasted fresh and sweet. Soup: Also very runny. I tend to think of potato soup as thicker and creamier (aka fattier), but since they're more health-conscious, it lacked that cream to give it the velvety richness. There also weren't chunks of potato, rather little potato bits. 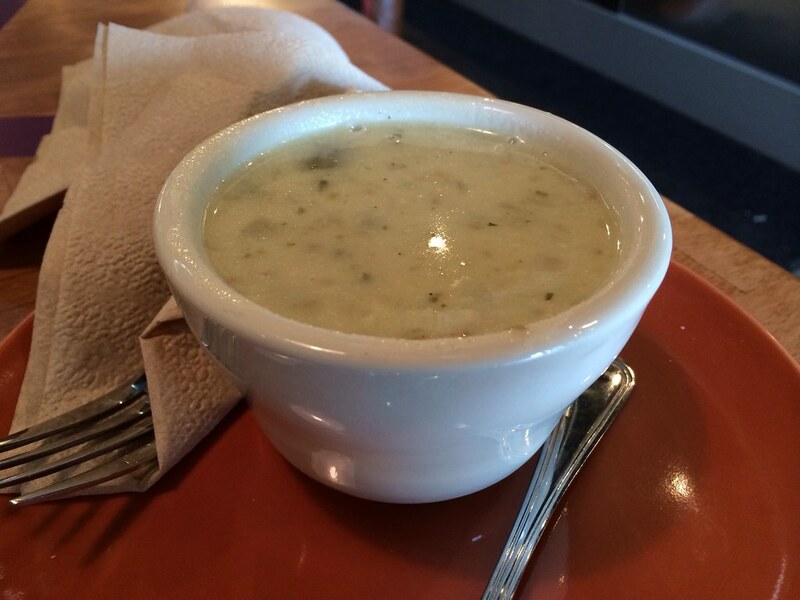 The flavor wasn't bad, but it was definitely a "potato soup lite." At the counter, they asked what kind of bread I'd like with my soup, but it apparently failed to make it to my plate. Or Tony's. 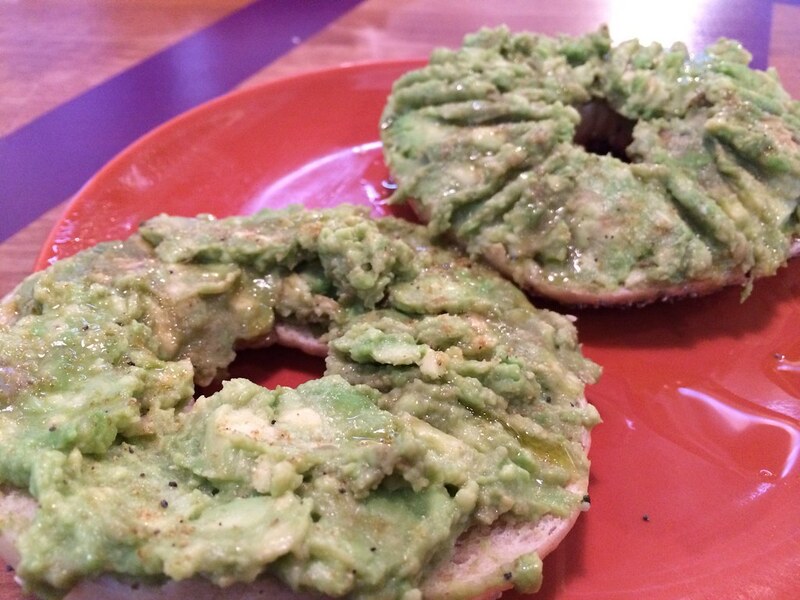 Avocado smash bagel: Okay, this was fine. It was a pretty good bagel (lots of seed! ), but you know how regular avocado tastes? Like an avocado. There's not a lot of flavor here. You typically use avocado in addition to something - not have it be the main flavor. They said there are spices, but nothing that I could taste. It was a tasty bagel, with a ton of just mashed up avocado and oil. Flavor was bland. Add a different texture (tomato?) or some spices or balsamic or something to accent the avocado flavor. I tried Tony's hummus, and it was OK. 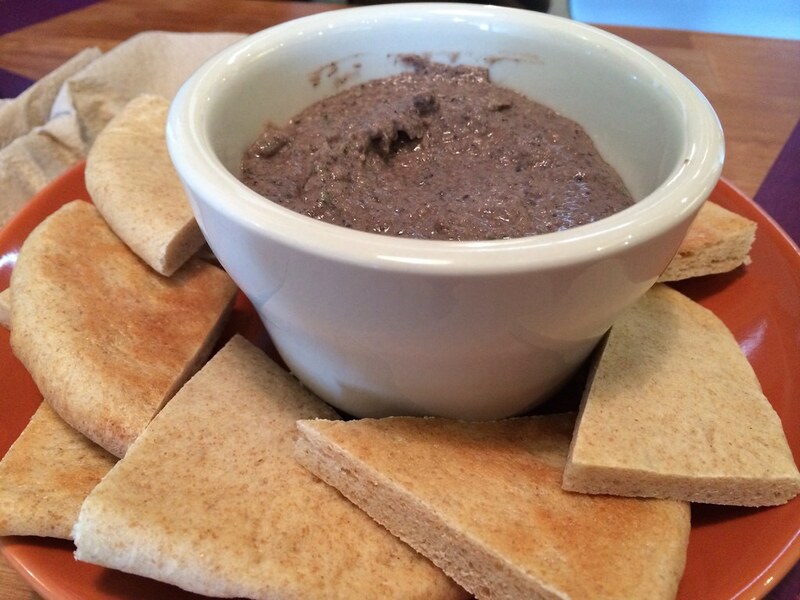 It was a blackbean hummus, but pretty good overall. SO. I get the point of this place, and it's probably a great option for folks are are very into juicing or not eating meat or just being conscious of their health in general. And this place tastes like it. I do think there are lots of options that are healthy but still pack a ton of flavor - the things I had here aren't really it, though. I think healthy food doesn't have to taste bland. I think with some more thought, some of these items could be punched up. 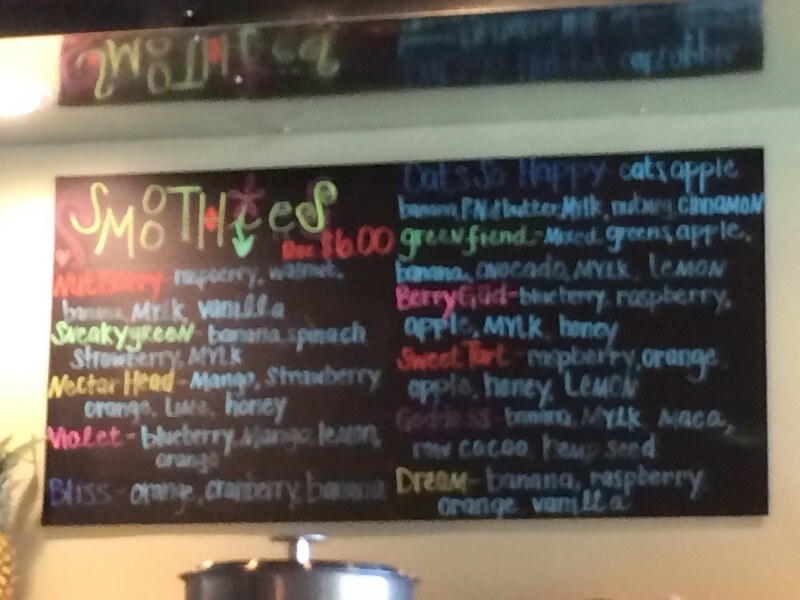 I liked the smoothie, but I think it should be cold and thicker. The soup was fine, but the avocado mashed up was bland. Just some spices could make it go places. And I simply can't afford $18 for lunch. Again, it is new, and it's probably already valuable for certain people. And they may be wanting those people who are on the fringe, but if you want the bulk, middle-of-the-road people who could easily be swayed to go to the new Panera that's opening, I think some small changes could help. I'd much rather support a local business over a chain any day. But I don't want to do it for a subpar product. They're open 7 a.m. to 6 p.m. Monday through Saturday. Closed on Sunday. Give it a go and let me know your thoughts.